If you like soft serve, you’ll love frozen custard. Since offering their first cone in 1999, Settlers Mill has been famous for its truly ‘old fashion’ frozen custard. Settler Mill serves only the freshest mouth watering frozen custard people deserve. The mix used to produce this gourmet ice cream is rapidly frozen, resulting in a smooth creamy texture. 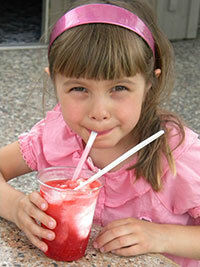 Enjoy a variety of treats from cones to sundaes, flurries and shakes all made with fresh frozen custard. Settlers Mill also offers nachos, hot dogs, brats, hot pretzels, chips, soft drinks, slushies and more. Challenging video arcade games surround the inside seating area, or enjoy an outside seat next to Settlers Mill’s trademark waterwheel roating under natural cascading water. Copyright © 2019 Settler's Mill.